Since new readers to Completely in the Dark have come aboard, thought it time to pause for a sec while keeping an eye on the what’s ahead. If you’ve been a regular reader, I’m grateful to have you here. Never intended to get back into long-form blogging. 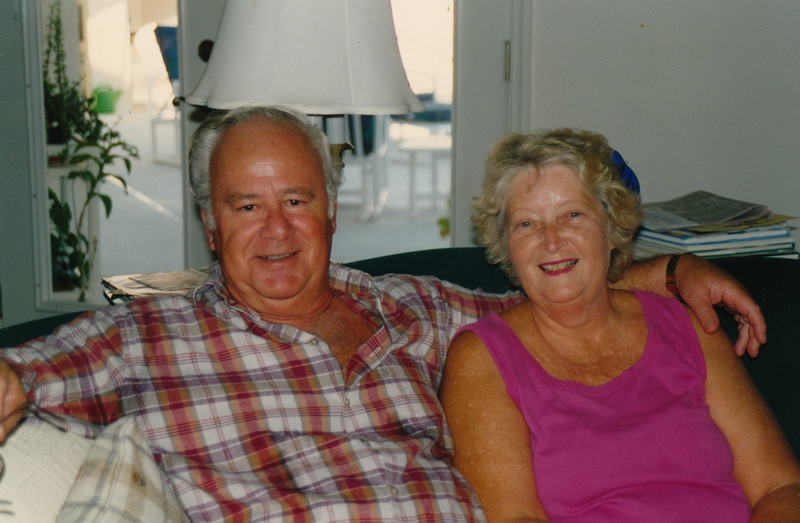 But after my parents passed away in 2008 (at right, pictured in 1994 after moving to Florida, one of my favorite last pictures of them together), and after I inherited a half-dozen boxes of family photos and memorabilia, my first thought was to somehow nail down the history. Completely in the Dark started in mid-2000s as a critical blog about film, analyzing movies for their storytelling chops and shades of meaning. I became interested in movies after writing a first screenplay in 1989. Since 2001, I taught screenwriting at a wonderful Twin Cities institution called FilmNorth. I adore these guys, and you should get to know them too. In 2008-2009, I was adjunct faculty at Minneapolis Community and Technical College in a similar course. I loved teaching. I just got disenchanted with writing for the screen. Food writing then came to the fore, so I thought about writing a food blog called Eating Me Alive (which is why you’ll notice Completely in the Dark’s URL is “eatingalive@wordpress” … but couldn’t get an angle I was happy with, so I ditched that. Abandoning things is not a problem I would emphatically stress as a problem, per se. Anyone who’s creative realizes that only a fool calls anything—anything—“finished.” It’s all a process, even when it’s been ostensibly ignored. Somehow the best ideas survive isolation, or because of isolation. So where to now, St. Peter? Keep forging ahead with Completely in the Dark as a repository of family stories and personal memories, another way to make sense of what I’ve learned (or failed to learn) about being alive. I never imagined, or planned, to give much thought to readership, but anyone writing for public consumption (a questionable phrase if there ever was one) has to, at some point, think about it. So, dear reader, here’s where you come in. In the next few weeks I hope to roll out a questionnaire, and introduce more conversation and interactivity to the blog. Stories are meant to be shared, and I want to hear your stories, too. Again, thanks for riding along. Love that you’re here. ~ by completelyinthedark on May 1, 2011.